During a brief trip to Milan, I managed to read through a book that has been on my bookshelf for a long time : “To Engineer is human: The Role of Failure in Successful Design“. This little book was first published in 1985, and went through some edits along the way (I read the 1992 edition). The book basically gives several examples of how learning by doing has been an integral part of the way that we design and create the world around us. Besides elaborating on some well known ‘engineering failures’ (Hyat Regency & Tacoma Narrows) the book gives a higher level overview of why things sometimes don’t work out as we designed or thought about them. And it is mostly this last bit that I found most interesting about this book. What I found most insightful was the reference to Sr. Oliver Wendell Holmes’ poem ‘The Deacon’s Masterpiece‘. This poem talks about the construction of a horse carriage (a one-horse shay) which is made with the best materials around. Yet, at the end of the poem it is made clear that even the best piece of engineering eventually fails and falls apart. The book then goes on about foreseeing failure during the design process, which is something I’ve been questioning myself in relationship to internet of things products – for example: the sunsetting of the Revolv smart hub and the fading of Bergcloud and their Little Printer. 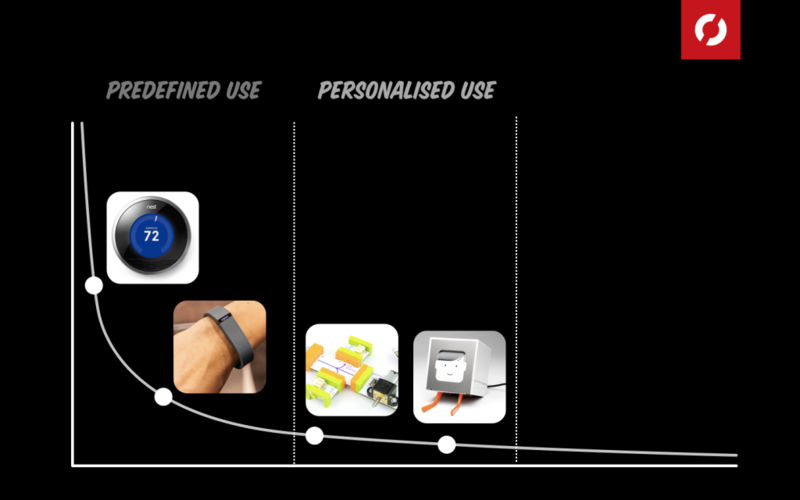 It got me wondering that when we’re designing connected products, we shouldn’t only think about mechanical failing of devices (buttons, moving parts, lights,…) but also the digital parts of the device (server connection, network uptime, technology deprecation,…). These novel aspects seem to be a lot more uncertain to predict, but they might feel a lot more easy to change, ie. shutting down a server happens by pushing some virtual buttons – the effect of that action is much less visible. There’s probably a lot of work done on this already, I can imagine that the same questions have surfaced in the home automation market. But I wonder if someone is actually doing anything about it, as the support for ‘legacy internet of things devices’ seems something we should seriously consider. Heirloom : an aftermarket #iot platform, keeping legacy devices alive. What intrigued me is that the book dates back more than 3 decades, but very much pins down what is still happening with novel products. Henry Petroski (the author) never mentions computerised systems as an example, but I think that his reasoning is applicable to a lot of the design and development of internet of things systems being created at this moment. All that put aside, the content of the book itself can be somewhat repetitive and the writing style is questionable. So probably not a recommended piece of reading, but it does trigger some thinking. The past two days I spent quite some hours at Screenshake, the indie game gathering in Antwerp – organised by The House of Indie. Last year’s Screenshake was good already, but looking back at the 2016 edition – the organisation stepped up their game quite a bit. Generally speaking, the reason that I like this event is that it is so crossover in every way. Disregarding the content, the indie game community is so very very nice to hang around. No one expects anything, if you want to engage you can – if you don’t no one will question that either. Less façades, more heart. I very much appreciate diving into a community I have a lot of respect for, that I do not really know in depth, but somehow feel related to. It also feels nice to not meet the same people at screenshake that I already meet at other events. New faces, fresh views. This totally resonates with me, and it frames the move away from games of studios like Tale of Tales rather well. The statement goes a lot deeper too, and does not limit itself to games vs. art. I might as well replace this with ‘The scientific research vs. art discussion is a sham’ – which very much relates to my own work. Lana’s talk was packed with references and insights I still need to process, this talk felt like a goldmine of inspiration … I just need to start building my shaft. Besides Lana’s talk, I got totally inspired by Paolo Pedercini. His deconstruction of SimCity and links made to systems thinking and ‘smart’ cities allowed me to look at my own work from a totally different perspective. I very much liked Paolo’s way of providing answers or strands of thought on how capitalism based algorithms (such as Sim City’s) can be approached in different ways. Game-like experiences as explorations of thought. The one speaker I was looking forward to since he was announced was Ste Curran. He totally captivated me at Screenshake15, so my expectations where high. Ste brings a talk in an extremely interesting format, being something in between a story, a theater play and a regular talk. 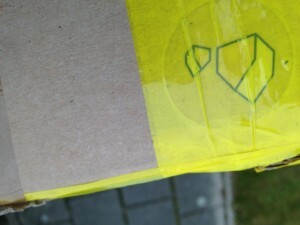 This ‘package’ is delivered with such honesty and authenticity that it is plainly beautiful. What stuck with me from Ste’s talk is being more conscious about the relation between the heart and the face, which very much links back to ‘dropping all facades’ I mentioned before. My 5 year old daughter who never held an Xbox controller in her hands and just figured it out after 2 seconds. Roland Barthes’ Death of the author. Mental models and computerised system models are a dialogue. I like to hold on to a lot of physical stuff. Postcards, birthday cards, the drawings my daughters make, magazines, etc. I take notes in a paper notebook. I love to write with a fountain pen. The above has been the origin of Archivatr. Inspired by the way Nick and Alex communicate conceptual ideas – I thought I’d try something similar. The holiday season is over. 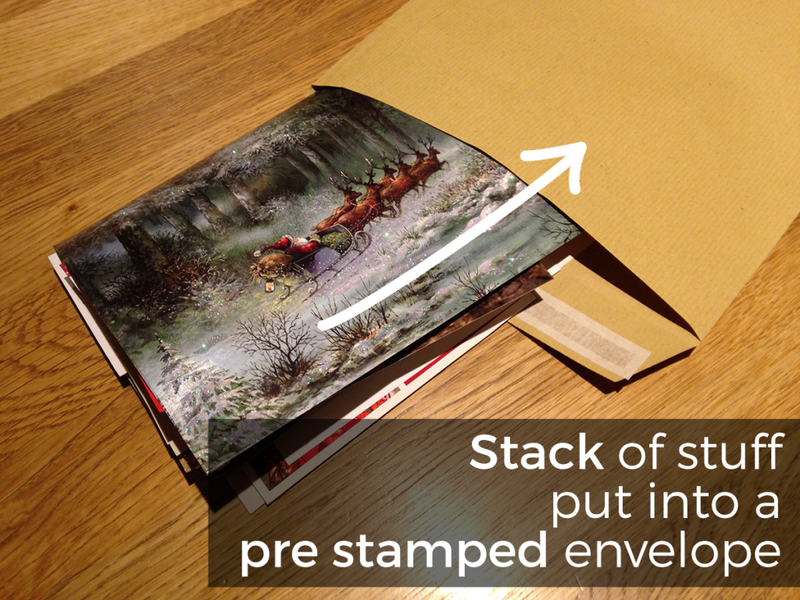 Time to get rid of the christmas cards … I’m having a hard time just throwing them out. 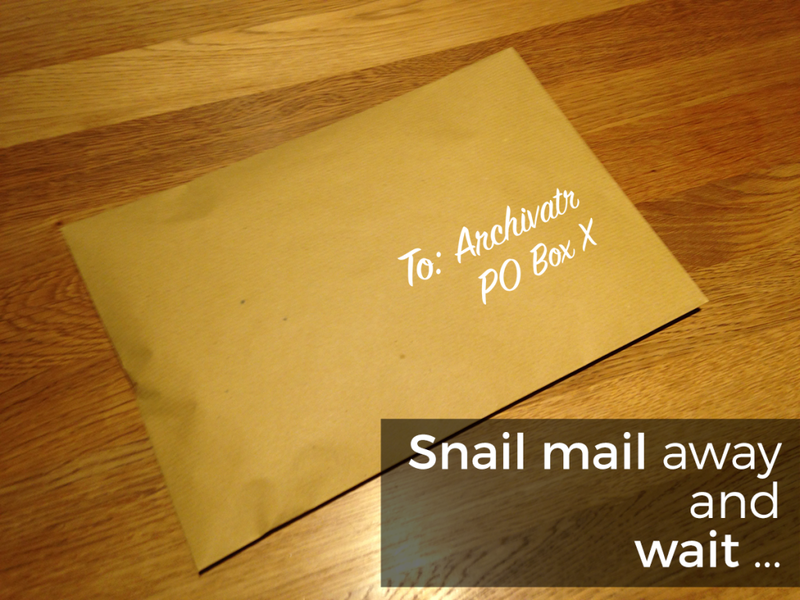 The Archivatr service sends me pre stamped envelopes, which I can use whenever I have non-digitals artefacts I want to archive. Depending on the complexity of the artefacts. 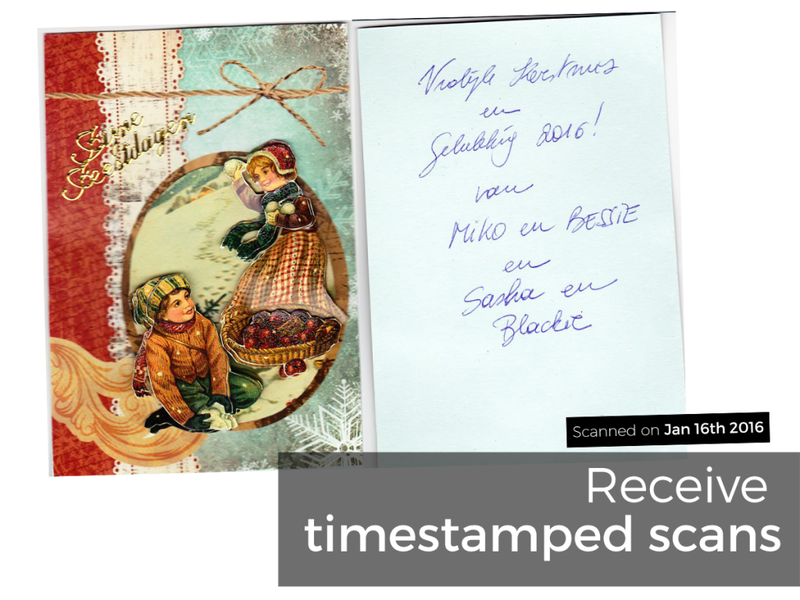 I receive a digitally indexed folder & files containing high quality scans. I can choose to leave these on the Archivatr servers or download them to my personal storage. Wait, this isn’t new at all. Currently, I have no idea about the viability of this service idea. Perhaps it has been done and failed, perhaps it exists but I don’t know about it. Or maybe I should go ahead and explore this further in more detail. I’ve been toying around with this idea for a long time now. It was time to get it out. If you have any pointers, feedback or comments – I’d love to hear them! Another year, another issue of the Bye Hi post (2015, 14, 13, 12). Overall, I have gone through some major changes – mostly related to the way I now think of my work and how I approach it. Perhaps for the first time in my professional career I am starting to develop some form of focus. The boat seems to hover around less and is slowly lowering more anchors. On a non-work related level, it it mostly all about children and the marvel of seeing them grow up. As a parent I constantly question myself on how I need to change/adapt my own attitude towards life. In 2015 we took care of two foster children. One of them stayed for 5 months, the other is still staying with us now. This is intense, and sometimes draws a lot of energy out of me and my wife. But seeing the impact of bringing some peace and harmony to the complex situations these children come out of is very rewarding. Yes! Rerouted it is. This has been my personal major achievement the past year. I managed to get a ‘Baekelend’ funding grant at Studio Dott to continue my research. The focus has been altered, and is now much more on design processes for products that consist of digital and physical parts (ie. hybrid product service systems). I’m really happy how this has turned out, for the first time in years I feel that people are actually supportive instead of sceptical – which changes a lot of things, mostly mentally. The publication I started working on resulted in a IOT Ideation Toolkit, which I worked on together with my excellent Studio Dott colleagues. We’re currently doing initial sessions with this set of tools, but it should be released to a broader public before the summer. Yay! I even wrote a longer post about it here. Actually read the books I buy. Yep, we’ve been doing some small projects on the side. Over the last year my father managed to build closer contacts with the people at OpenDesk – I hope this will take off at some point. We attended a larger interior objects oriented trade fair last year, where we showed some pieces of the OpenDesk collection. We had an advert in Charlie magazine. But ‘selling’ the whole CNC thing to a mainstream audience is not straight forward. This was good. But I think my wife and I are enjoying it more than our children. Nevertheless, geocaching has been a good mechanism to get us out of the house and explore places in the neighbourhood. We know the world is lost. Out of all ‘2015 year ending’ posts, the closing paragraph in the tale of tales one stuck with me most. I can totally relate to this, and really look forward to their work in the days, months and weeks to come. We know the world is lost. We don’t believe humans can fix it. Because they don’t want to change the system that causes the problems. We’re longing for the apocalypse. But in the mean time, we want to really look at the world. Perhaps with the eyes of a lover saying goodbye. The beauty, the joy, the sheer magnitude of life. And pay tribute to all of it in our work. A prayer. A wish to experience beauty each and every day of the entire year. —Michaël & Auriea, 31 December 2015. Thingscon is turning out a very nice place for me to reflect on IoT in a non technical and business dominated mindset. I took some quick notes during the talks. Not intending to be coherent, but pointers that stuck with me. The whole idea of scriptable product is starting to make sense. I do think we need to get rid of the term platforms. Currently I’m trying to figure out what a physical product would look like if it were created just like an Angular.js website is ‘generated’. Another indication that the type of products we are moving towards do not need to have a specific end result. They should leave space for interpretation. Note : this does not equal customisation. Designerless creation of Shanzai phones : why do we not all work like that? Prototyping and making in low quantities while designing a product seems to make more sense. There was a clear clash going on here between the traditional way of thinking about the design discipline and the ‘maker’ approach. System latency as a feature, embrace it and do not try to design around it. Arcane interaction seems to relate with my thinking about meaning and next generation alchemy. Also, I just like the term. What has early adopter crack looked like in the past? Makes me think about the TBD catalog. By using the term ‘clever’ instead of ‘smart’ city, the humane dimension of it all skyrockets. Ross’ examples on how to actually think about this is rather spot on. The prime reason I visited thingscon in Amsterdam was to talk to some people about the IoT ideation and design processes for IoT work which I’m working on at Studio Dott. I met several known and new people, which was exactly what I wanted to get out of the event. Since I was at the previous two thingscon events in Berlin, the general ‘content’ was mostly a confirmation of previous insights. I had the feeling there were a lot of ‘new’ people begin introduced to the people/social/design oriented thingscon content. This is excellent, but at the same time I felt the need for a more in depth track. Nevertheless, the thingscon family is rather unique – which I am glad to have experienced once again! Suppose that you’d put 10 knowledgable people in a room, chances are high they all have a different understanding of ‘the Internet of Things’. Someone working for a startup company will think totally different on this compared to someone working at a larger company. Someone working in a B2B dominant domain will think about different ‘use cases’ than someone who primarily works on B2C products. I have the feeling that these semantic discrepancies are a source of confusion and unnecessary discussions. In the term ‘Internet of Things’ the focus is very much on technology (the internet) and things. It all feels very much driven by efficiency and functionality, whereas I believe we should strive to create products with emotion and meaning. When using a term like connected products, I feel that I am artificially trying to split products into categories. The ‘connected’ ones versus the ‘not connected’ ones. I think it is important to not make this difference, increasingly often we are creating digital and physical products at the same time. It seems to make little sense to keep distinguishing between them. Using ‘hybrid products’ somewhat solves these issues, but the term doesn’t take a stance. It is neither fish nor fowl, and might even make it more hazy to understand what we are actually talking about. Braiding always involves various ‘strands’ which are interwoven. To me, this is exactly what we are doing within the ‘internet of things’. 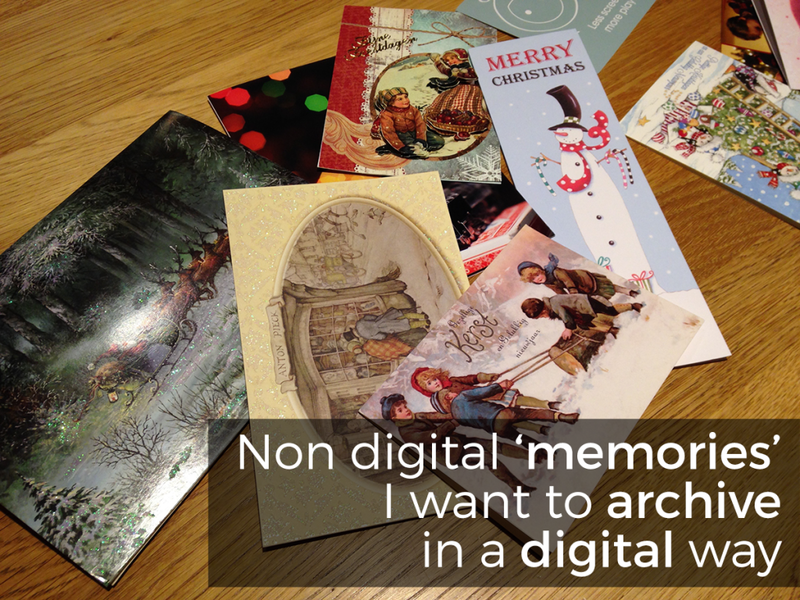 We combine digital, physical and services to create one ‘combination’ thereof. The focus is on the humane. Technology is not explicitly referred to, but is regarded as something taken for granted. When braiding something, you go through a process in which expertise of ‘the braider’ can impact the end result. It refers to a process of creation, something which needs to be well thought out before it achieves what it is intended to do. I’m not sure wether coining new terms for old concepts will help the field in any way. But when reflecting on ‘braided products’ I get the feeling that this ‘type’ of wording comes a lot closer to how I would like ‘the internet of things’ to be interpreted at the moment. Ever since Alexandra announced the GoodNightLamp as something that was going to happen ‘for real’, I have been a #lampfan. Since the beginning of summer I’ve been living with an actual, functioning, GoodNightLamp and I wanted to share some insights and general thought of how I’ve been experiencing it. Should the GoodNightLamp not ring a bell at all, I suggest you read up over here or watch the video below. Currently I think I have gone through 3 stages of use. Starting from getting acquainted with the product, to actually using it ‘for real’. My GoodNightLamp story started rather bumpy. I won’t go into too much detail, but initially it just didn’t function in a reliable way. Luckily communication with Alex and her team is very transparent, so we managed to arrange for sending my initial set of lamps back for technical maintenance. When they came back from surgery, things were looking a lot ‘brighter’. The GoodNightLamp has only one interface element, being the button on the chimney. The nice thing is that the interface is so simple, but when something goes wrong it is (as a user) almost impossible to figure out what is happening or going wrong. Being a designer interested in technology myself, I wanted to try to understand the system – how does it work? Can I open this lamp to fix it myself? But once I got over these thoughts and behaved like a ‘regular’ user, it started to make more sense. Embrace the magic of the lamp. Initially, I wanted to place one lamp in my parent’s house and one lamp in my own living room. But after thinking this through together with my wife, we concluded to that we’d see how we could use it to enhance social contact within our own family. It seemed to make more sense to inform each other about presence between work and home instead of knowing if one of our parents is home or not. I think the aspect of distance played a role in evaluating who would receive the lamps in the first place. Both our parents live very close, and we tend to be in touch at least a couple of times a week. Another aspect which is playing a role here is that we wanted to experience the product ‘first hand’ first, before handing it over. 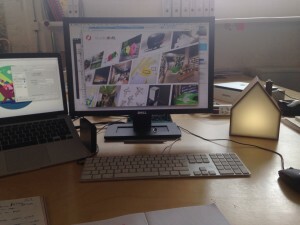 So we initially started out with placing the large lamp at my office near Antwerp and have the little lamp at home. The idea was that I’d light the large lamp when I arrived at work and switch it off when I left again. After doing this for a bit over a week, it was turning out to make very little sense. No-one was looking at the little lamp at home, and I was having all the fun at work because I could at least press a button. It was nice, but became monotone very quickly. After that first week-and-a-half, I decided to switch the lamps. At that point, I realised that my children could play a crucial role in this whole lamp experience. It made much more sense that I would know when someone is home while I am at work, especially when my children are home. Also, my children would be the perfect subjects to assign the ‘switch the lamp on’ task to (as my wife would probably forget about it most of the time). Currently this setup is working out wonderfully. We’ve been using it for over a week like this, and compared to the previous setup – this configuration is actually enriching. I’m psyched when the little lamp pops on while I’m working, and my children love to push the button on the large lamp. My 4 year old has started to see it as her ‘duty’, and takes it serious (perhaps a little too serious). Since the time that the lamps are on and off can vary quite a bit, it arouses curiosity – triggering conversations at the dinner table about what happened during the day. The journey of figuring out how to maximise the meaning of the lamps has been an interesting one. Initially, I was a little disillusioned. But after trying things out iteratively, I’m really enjoying living with the GoodNightLamp. The critical thing will still be the evaluation over time, will it become a routine, or will I keep enjoying it? The ‘hunt for meaning’ should not be underestimated, and I can imagine that it might put people off – turning the lamp into an overpriced paperweight at some point. I wonder to what extend people should be guided in finding meaning in products, in what way(s) they can be inspired to endeavour on a journey of exploration. To conclude, by using the goodnightlamp I’ve figured out that the aspect of ‘temporality’ in Verganti’s definition of meaning might go a lot deeper than I thought (cfr this post on connected products and meaning). The meaning of a product is temporal, initially I thought about this related to products that ‘hype’ and fade away later. But by experiencing the goodnightlamp, I realised that one product can convey a type of meaning at one moment in time and evolve during use. Over the years I’ve been working on connected products, and how they can become less technology centerend. The goodnightlamp is one of the examples I like to use when talking about connected products and meaning, but in order to keep using it as an example I feel obliged to use it myself and (critically?) reflect on my experiences. There are too many good quotes in this Medium answer by Esko Kilp on this post by Tim O’Reilly. I suggest that you just read the whole thing. 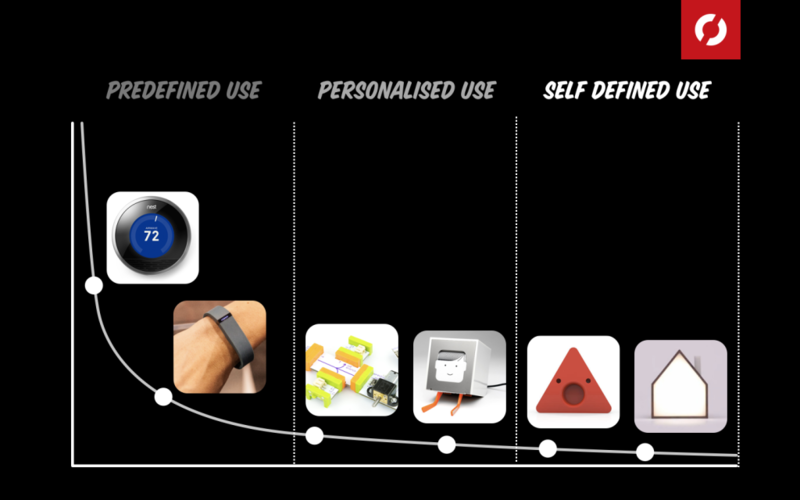 During #thingscon 2015 I talked about meaningful connected products. 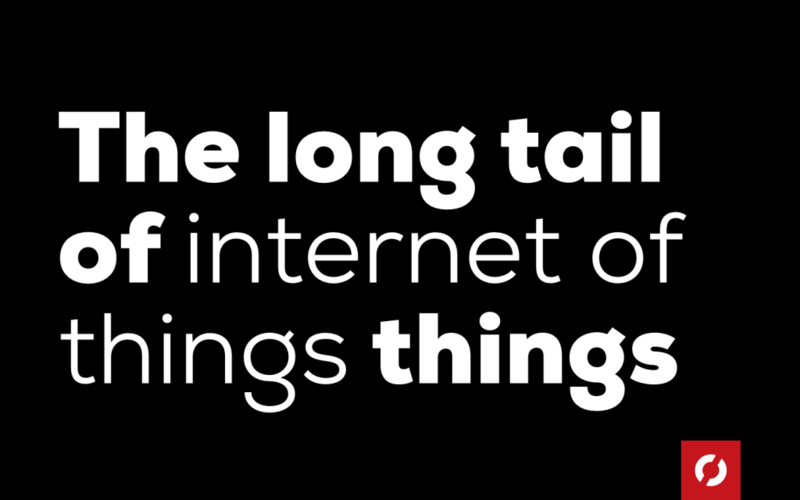 I wrote about some central concepts of meaning on this blog before, but consolidated some of that thinking in a new model : the long tail of internet of things things. Note : this model is not validated in any way. I put it together in a rather arbitrary way in order to understand ‘meaning’ better within the connected product context. Note 2 : I used an ongoing Studio Dott project (DIOTTO) to illustrate this model. The origin of the model resulted from previous research which was conducted at the University of Antwerp, department of Design Sciences. I plan to write an extended post on the case used and how it relates to ‘meaning’. 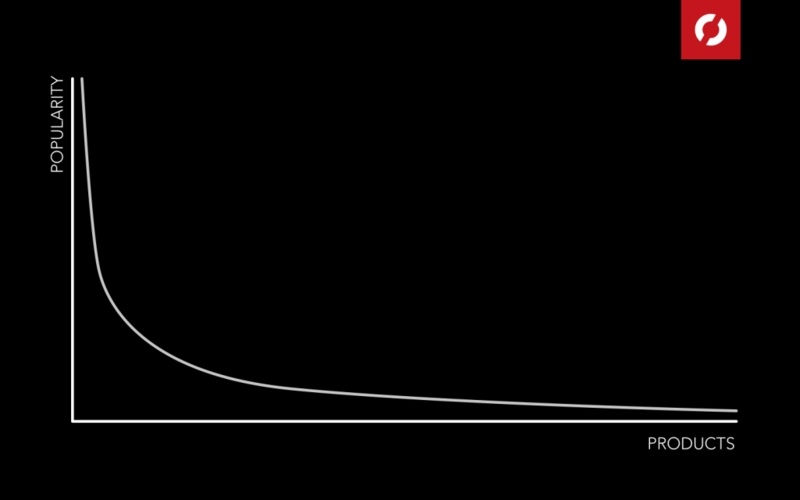 This is the ‘classic’ long tail power law graph. The graph shows that a small amount of popular products serve a substantial amount of people. As you move to the right of the graph, the popularity becomes lower – but however small the niche, a product can be found. An example of this can be found in music, Justin Bieber would be on the far left – an obscure black metal band would be on the right. 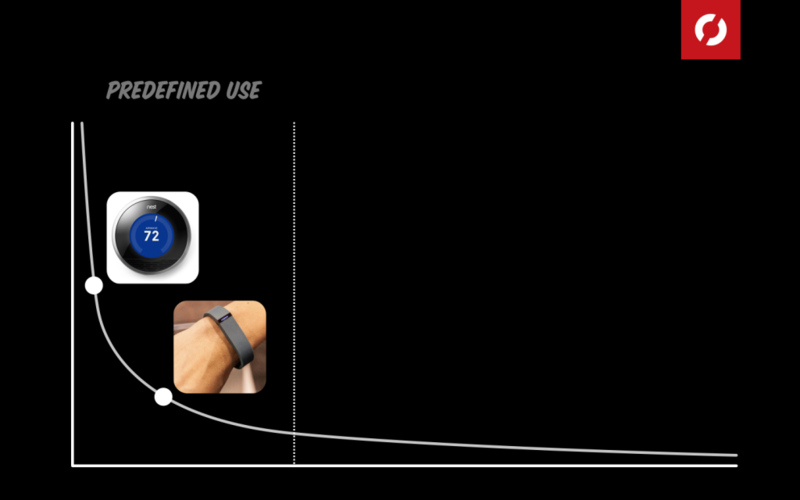 When you map connected products on the long tail, something interesting happens related to the type of use of this product. I was able to identify three categories. Firstly, products that have a predefined use. An example here is the Nest thermostat, it controls the temperate of your house. You can interact with it in a predefined way, the expectation of this product is very clear. A second category are products with a personalised use. This means that they can adapt themselves to the person using them. This is often achieved using modules or building blocks. Little printer is (was) an example of this; it offers a list of publications which you can choose to print on regular intervals. As a user of such a product, you are free to do things within predefined boundaries. The third category is when the use of a product is self defined. These type of products typically offer a platform for interpretation. There is no specific expected use, there are no paved pathways. You assign the function of this product in your own way. What these products do provide are cues for interaction, like the GoodNightLamp, it looks like a lamp … so maybe it is something domestic … but it doesn’t have to be that if you don’t want it to. 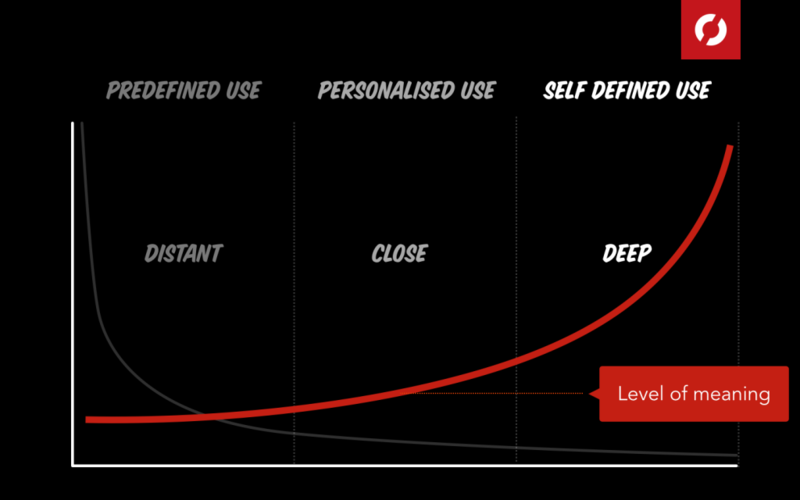 Using these three categories, the potential level of meaning rises exponentially as you move to the right of the graph. A connected thermostat has a rather distant ’emotional’ relationship with the person using it. Products that allow people to define the function themselves can go much deeper regarding meaning. 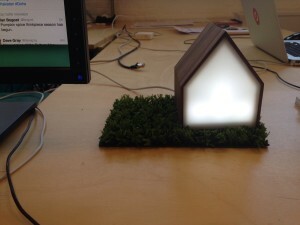 For example, the GoodnightLamp is a product that focusses on social contact. The product is merely the mediator for emotions and thoughts that go much deeper than turning a lamp on and off. This is what the model is about, in a nutshell. When I saw Claire Rowland‘s talk at thingscon later that day, it became clear to me that there probably a difference whether a connected product is a ‘tool’ or a ‘product’. Claire used a Belkin network controlled plug as an example of a tool. The use of the plug is not really predefined, it requires someone to define what it is used for. I do wonder if someone could get emotionally attached to a plug though. So perhaps I should distinguish between a tool and a product in a future iteration of the long tail of internet of things things. Thingscon was an excellent place to present this model for the first time. If you’re interested in chatting about this, have reflections or thoughts – I’m very open for critical constructive discussions!